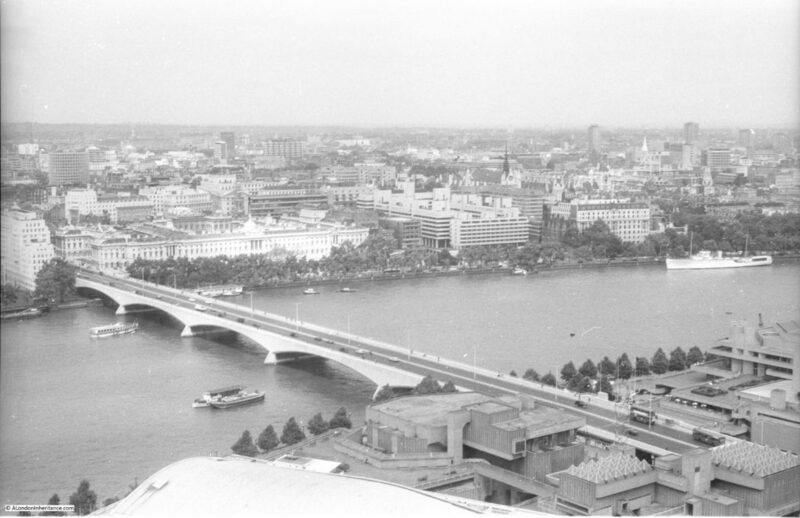 In May 2015 I published the photos I took in 1980 from the viewing gallery at the top of the Shell Centre tower on the Southbank. The viewing gallery was closed for public viewing soon after opening, however I recently found a copy of a booklet titled Panorama of London that was part of the public visit to the gallery and provided fold out views, labelled with the sights to be seen, distances to towns surrounding London and heights of the hills on the horizon. Walking around the viewing gallery with the booklet, visitors would have been able to pick out all the key features of the view before them. There is no date in the booklet to date publication, however I would estimate it to be from the mid to late 1960s. There is an introduction which provides some statistics on oil consumption with 1960 being the most up to date figure and 1975 being used as a date for expected future consumption. 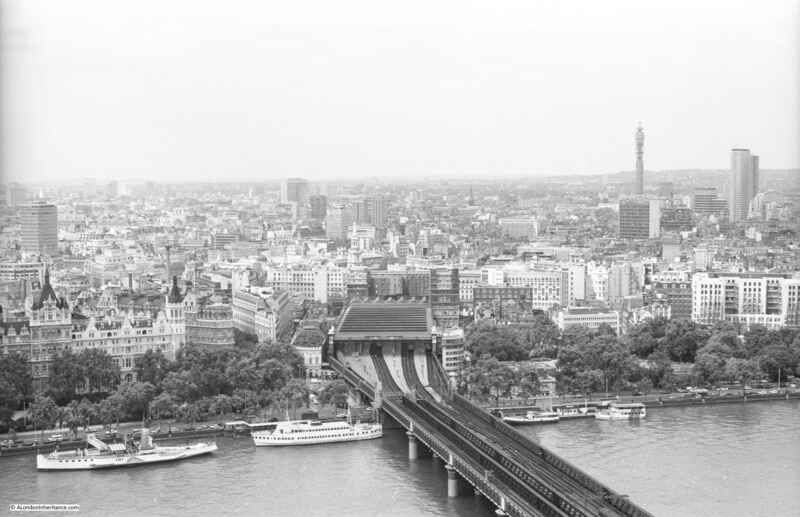 The views also include Millbank Tower, built in 1963 so the booklet is not from the early 1960s. The booklet starts with an introduction to the Shell Centre complex, informing the visitor that the viewing gallery is on the 25th floor of the Shell Centre tower, 317 feet above sea level. 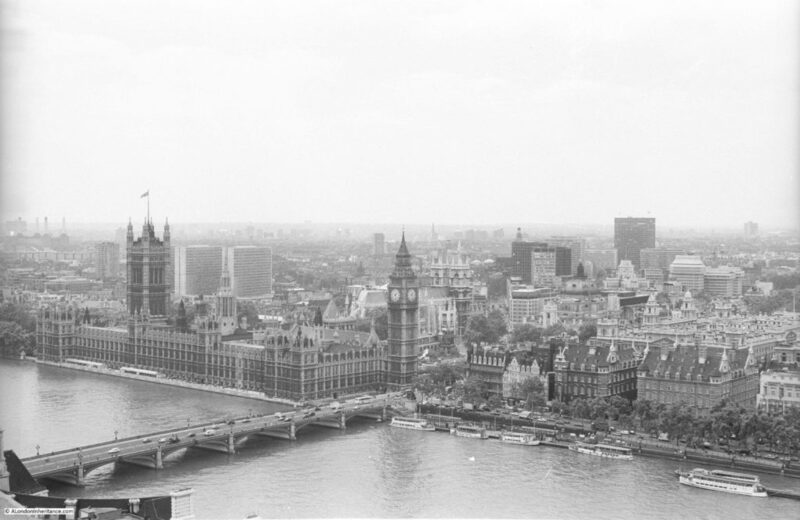 The tower block in total is 351 feet high, just 14 feet lower than the cross of St. Paul’s Cathedral. The booklet has four fold out views, corresponding to the view from each side of the tower. Each view consists of a transparent layer, labelled with the sights to be seen, which overlays a detailed drawing of the view. So, lets commence a walk around the viewing gallery, starting with the view to the south-east and east from the rear of the tower. (Click on the pictures to open much larger versions). In this view, Waterloo Station occupies much of the area immediately to the frount, however moving from the east we can see Southwark Cathedral, Tower Bridge, Guy’s Hospital, the Old Vic Theatre. Elephant and Castle, and the Imperial War Museum. On the horizon, Shooters Hill at 425 feet and a distance of 8.5 miles away, Knockholt Pound at 587 feet is 17.5 miles away and Tatsfield Gt. Farm at 784 feet is at 16.5 miles. Moving to the side of the tower, we can look towards the north-east and the north. Here we can see the City of London. Bankside Power Station with a smoking chimney is on the south bank of the river. Cranes can still be seen along the south bank of the river between Waterloo and Blackfriars Bridges. St. Paul’s Cathedral is still the highest building in the City. 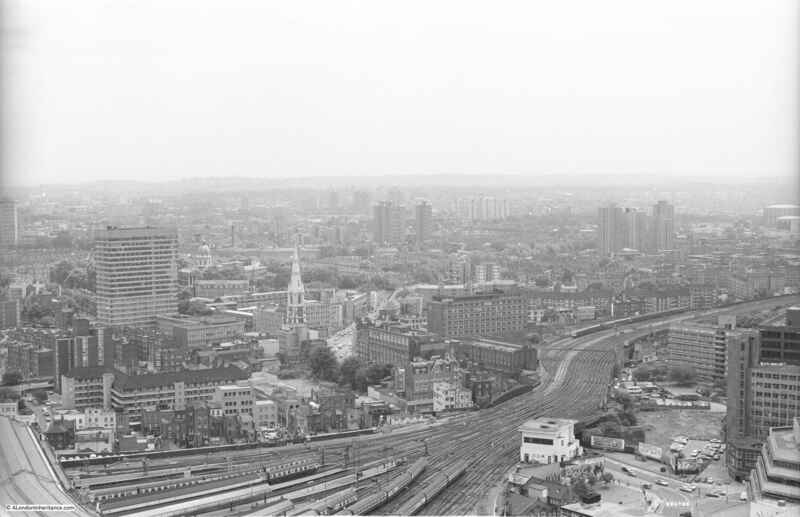 The view moves to the north passing through Shoreditch, Islington, Holborn and to part of Bloomsbury. On the horizon is Fox Hatch at 338 feet and 20 miles distant. Epping Forest is 14.5 miles away, and we can see Alexandra Palace on the horizon. We now move to the part of the viewing gallery that is at the frount of the Shell Centre Tower, looking from the north-west to the west. On the north-western edge is Senate House of the University of London. We then come to the G.P.O. Tower (now the BT Tower), then Charing Cross Station and Hungerford Railway Bridge, Nelson’s Column, the three parks of St. James’s, Green and Hyde, then the Albert Hall and on the far west, the start of the museums of Kensington with the Victoria and Albert. On the horizon is Elstree at 478 feet and 12 miles, Harrow Weald at 486 feet and 18 miles, and the Kensal Green Gasholder at 5 miles. 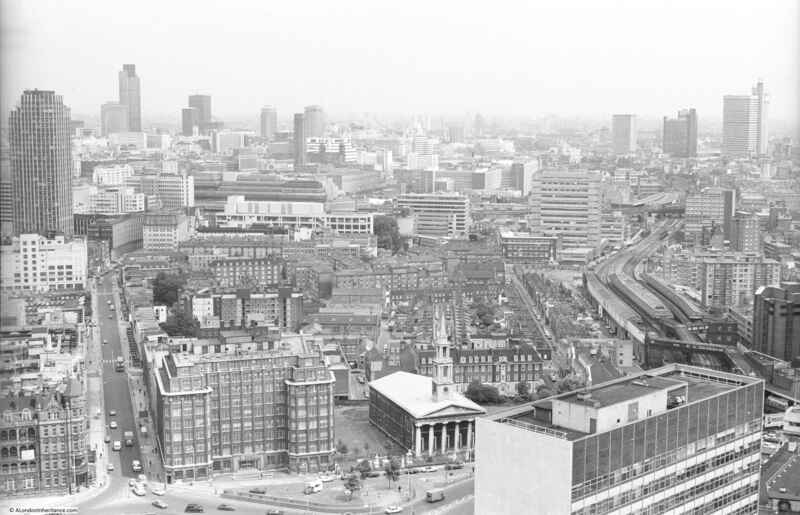 The final view in this Panorama of London is to the south-west and south, from the side of the Shell Centre tower. The Palace of Westminster and Westminster Abbey are across the river, and moving to the south, the chimneys of Battersea Power Station are smoking. 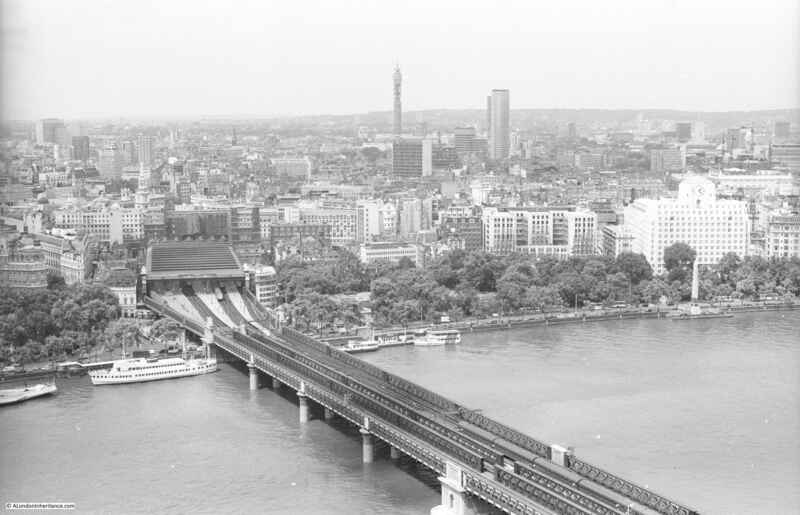 We then come to Millbank Tower, Vauxhall Bridge, Lambeth Palace and the Kennington Oval. On the horizon is Windsor Great Park at 20.5 miles, Oxshott at 257 feet and 15.5 miles, Coulsdon at 468 feet and 12.5 miles and finally Woldingham at 868 feet and 16.5 miles. 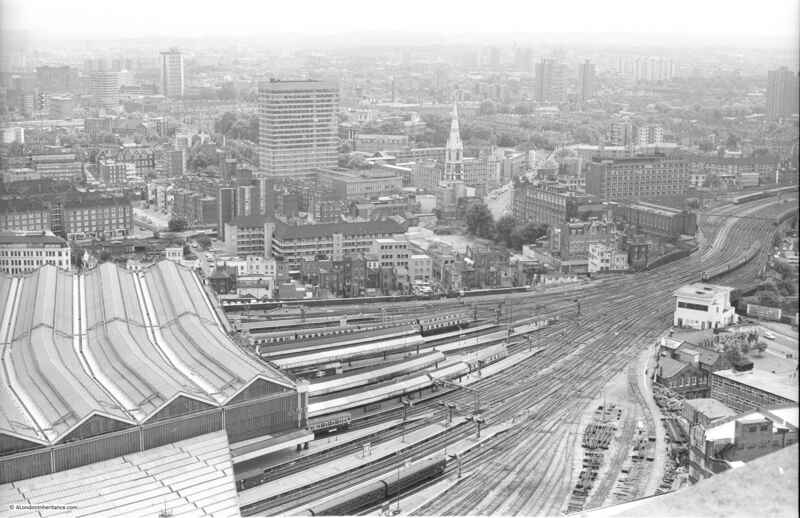 Then round towards the east with the rail tracks running through Waterloo East and onward towards London Bridge. 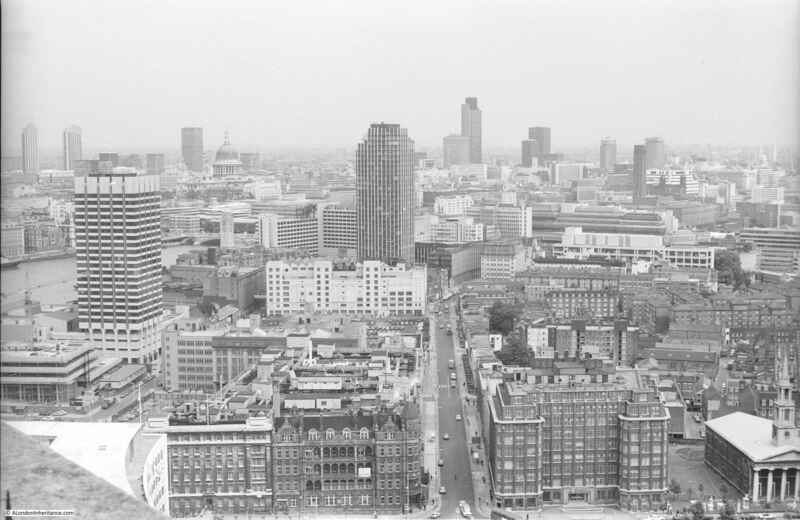 Now with the City coming into view with at the time the tallest tower in the City, the NatWest Tower, completed in 1980 and now known as Tower 42. In the following view, Stamford Street is leading off towards the east. Kings Reach Tower is adjacent to Stamford Street, completed in 1972 and was the home of IPC Media, the publishing group behind a diverse range of publications from Loaded and NME to Country Life and Marie Claire. 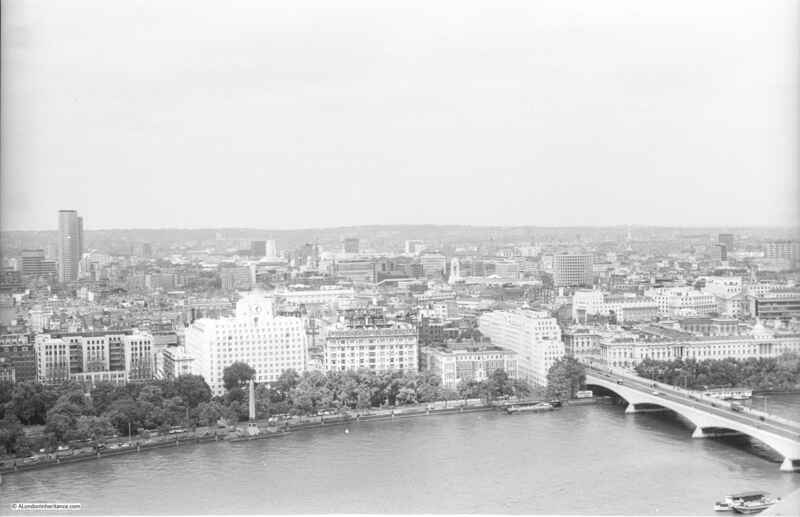 The tower has now been converted to apartments with several floors added, and renamed the South Bank Tower. I took photos from the top of this tower in the late 1990s. 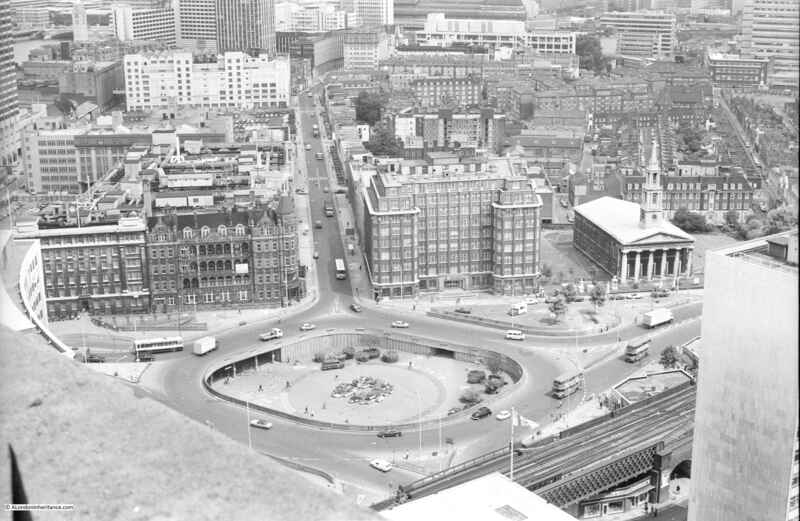 At the junction between Waterloo Bridge, Stamford Street, Waterloo Road and York Road was this large roundabout, now the home of the BFI IMAX cinema. 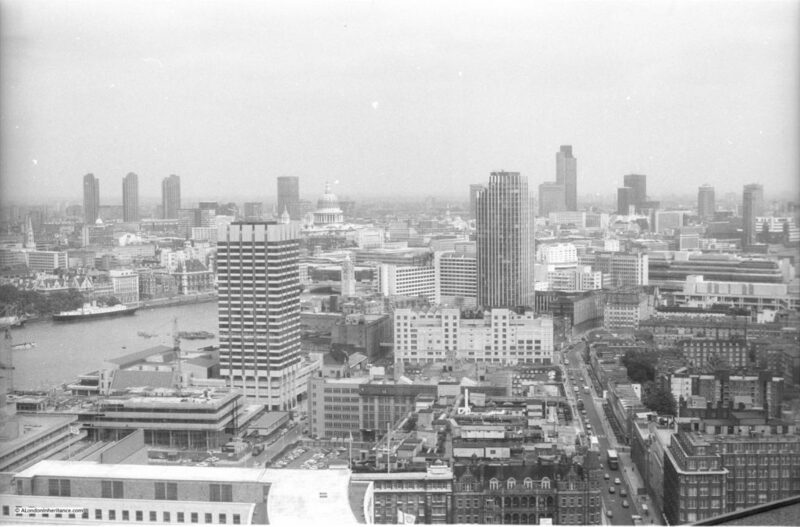 Looking over towards the north-east and the towers of the Barbican come into view. The tall building closest to the camera is the London Studios – ITV’s main home in London. Built in the early 1970s as the home for London Weekend Television (seems strange now remembering the Friday evening switch over to LWT). The studios here had been hosting some of ITV’s daytime output (now moved to the remaining studios at the old BBC Television Centre at White City) and large Saturday night shows. The site is about to be redeveloped with new offices for ITV, a set of smaller studios so that the daytime TV shows can return, and (you have probably guessed) a much taller residential tower which will be built on the site of the existing tower. Moving along in my Panorama of London, this is the view over Waterloo Bridge. The white building adjacent to the river is the old Shell-Mex House building and moving back, towards the left is Centre Point, at the top of Charing Cross Road. 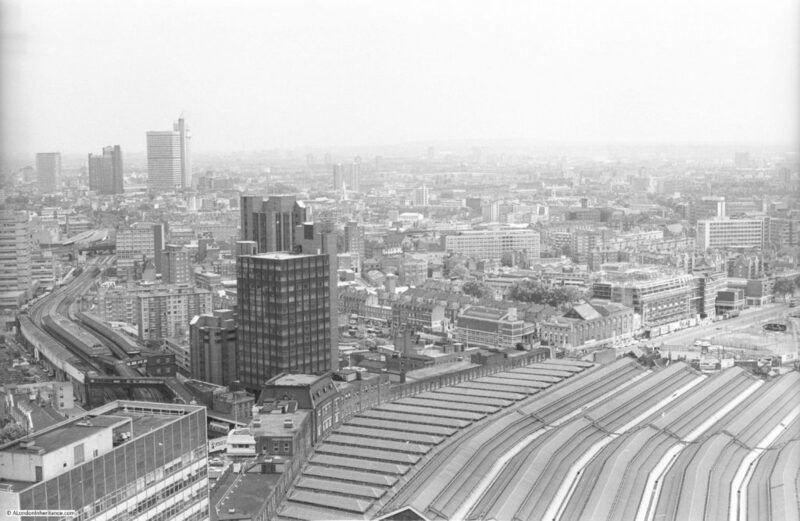 Charing Cross Station and the BT Tower. Slightly further to the left. 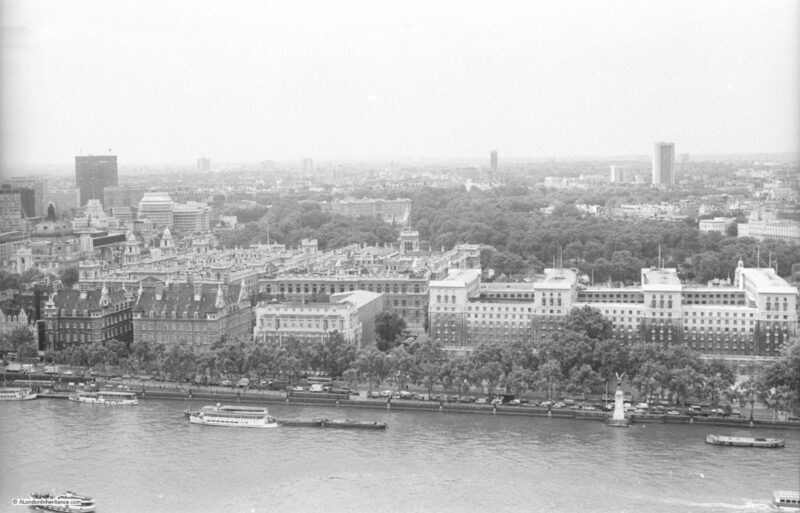 The Ministry of Defence building along the Embankment to the right. And finally the Palace of Westminster. The London Eye would now be obscuring much of this view. The skyline of London is rapidly changing. For Shell Centre, the office blocks surrounding the base of the tower have been demolished and new apartment blocks are being built around three sides of the original tower. It would be interesting to see if I can get back up to the viewing gallery in two years time for a 40 year then and now set of photos, as the view will be very different to the Panorama of London and my 1980 photos. 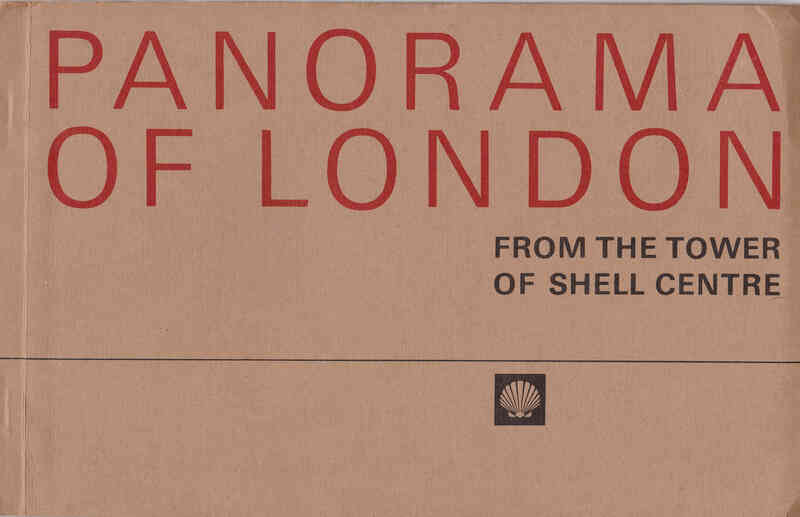 This entry was posted in London Vistas and tagged Panorama of London, Shell Centre, Southbank on April 27, 2018 by admin.